This month’s Daring Baker’s Challenge is another first for me: cheesecake! Baked in a water bath and everything! I left the flavor choosing up to Z and my dad, since they both love cheesecake. They agreed that chocolate was what they wanted, with dad being interested in the idea of chocolate shavings on top. As you can see, I got a little more creative than that. Guess what's getting good? Strawberries! The strawberries are getting goooood (so is the corn…I was feeling like a true Mainer happily taking in the combined scent of fresh sweet corn and ripe strawberries at the grocery store) and since I had used the blackberries I originally bought for the cheesecake for some incredible ice cream, I decided to go with a chocolate-covered strawberry theme. I wandered downstairs yesterday morning, pulled out some chocolate, my Silpat and some strawberries and went to work. 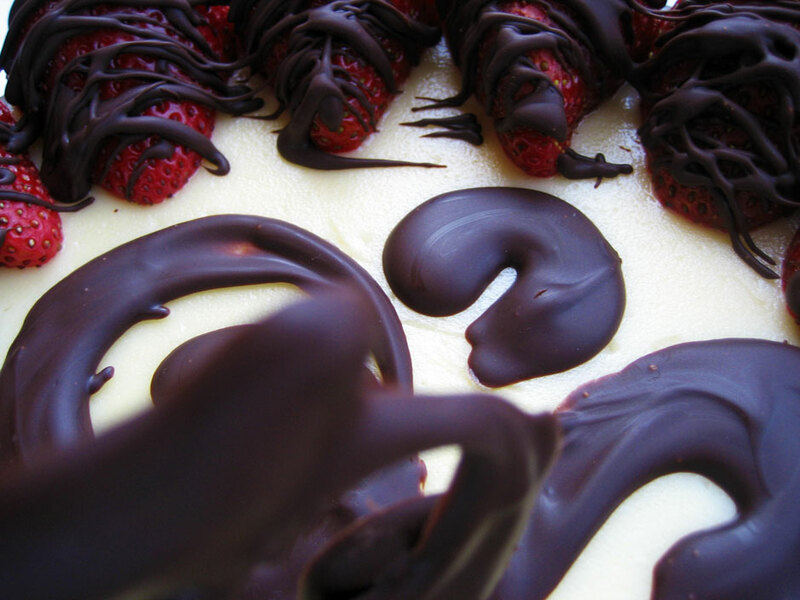 I arranged the strawberries around the edge of the cheesecake and melted the chocolate, tempering it all ghetto-style by melting half in the microwave and mixing in the rest of it in until it was smooth. I had to re-melt it a couple times so certain pieces weren’t as nice as the first ones, but I had fun swirling shapes. I made one piece look (sort of) like a strawberry and stuck it to the giant swirl that I stood in the middle of the cheesecake. The edges looked a little sad and ragged so I made some round chocolate disks and used some more melted chocolate to affix each one to the exposed end of a strawberry. I probably should have gotten a picture of the plain cheesecake before putting stuff all over it. It was PRISTINE. Oh yeah – I also made my own graham crackers for the challenge. I followed Alton Brown’s recipe, which turns out a tasty, full-flavored batch of graham crackers. I also don’t own a food processor and used a pastry cutter to blend the dough, so my graham crackers come out a bit “healthy” tasting with the whole grains in them. But they’re totally delicious that way and easy enough to make yourself. I also made the crust a bit chocolate-y by adding 1 Tbsp cocoa powder. The crust doesn’t have an overt chocolate flavor, but between the cocoa and molasses it does have a lot of deep, rich flavor that contrasts well with the creamy cheesecake. I used blackberry brandy for the liqueur in the recipe, just because it’s the easiest berry-flavored liqueur to get my hands on. I also had about 4 oz. of leftover mascarpone from some fabulous pasta, so I substituted that for 4 0z. of the cream cheese. I don’t think it made much of a difference, though it probably balanced out the small amount of milk I had to substitute for a few missing Tbsp of cream. Z absolutely loves this cheesecake. I would definitely make it again – it was a little time-consuming but it was all very easy. The water bath was probably the most nerve-wracking part, and even that wasn’t so bad. I used a very shallow pie plate and ended up with quite a lot of leftover filling, so I baked them without crusts in some shallow, oblong ramekins I happen to have (transferring them in their very shallow, sloshy water bath was even more nerve-wracking than the big one). They might be seen over the next few days, as the things I bought to top them are perishable and I can’t eat all that cheesecake at once! Love the way the cake looks — ditto your blog. Congratulations! 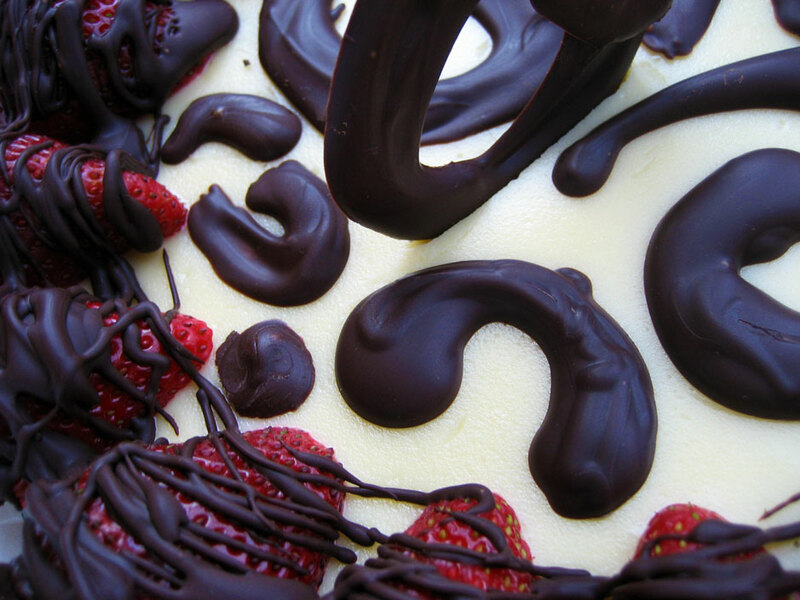 Now that is definitely a show-stopping cheesecake! Love the chocolate swirl decorations. This is beautiful! I did a strawberry (and white chocolate) pairing as well and it was our favorite variety. I can’t believe you made your own graham crackers. Wow! I sweat Anna! Each and every post just gets better and better! You are a pastry queen!! Anna, thanks for stopping by and commenting on my mango cheesecake. Yours looks very fanciful and joyous with its chocolate swirls! Your cake has a beautiful Victorian design! I love the chocolate decor! 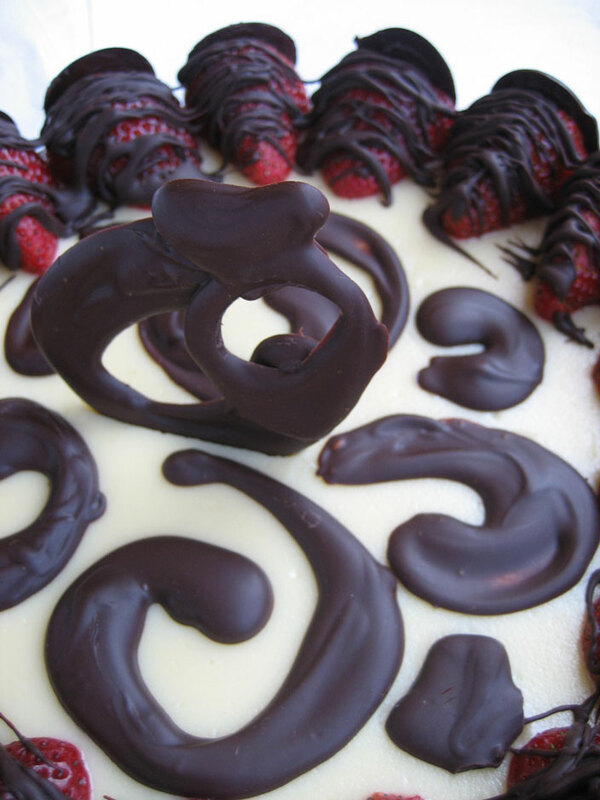 Love the way you decorated your cheesecake, so elegant! Not to mention, the homemade graham crackers no doubt made this cheesecake even better! Very nicely done! Wow, you even made your own graham crackers! Pretty and delicious looking cheesecake! The chocolate designs are awesome. Nice job. Wow. I’m seriously impressed by the chocolate decorations on top. Those are stunning! You made your own graham crackers … I’m in awe! Wow you made your own graham crackers too! Talk about baking from scratch :) Love the decorations by the way. WOW! You’ve put a lot of effort in this cheesecake! I love the chocolate decoration on top! How did you manage to do it so perfectly? What fun decorations, your cheesecake looks great! great looking cheesecakes. Good job on the chocolate decorations. You made your own graham crackers too? Wow! The chocolate swirls look very nice indeed. It is funny because since I follow you on Twitter now, I’ve seen many of your more recent posts. But I’m STILL going through the blogroll to comment on this cheesecake challenge since I hosted it, and there are over 1000 of us DB-ers around. I really love the boldness of the swirls, and would love to taste this cheesecake with the blackberry liqueur!